This is the most impressive POTF2-era Star Wars prototype I've ever seen. In truth, this thing is downright impressive, regardless of era. 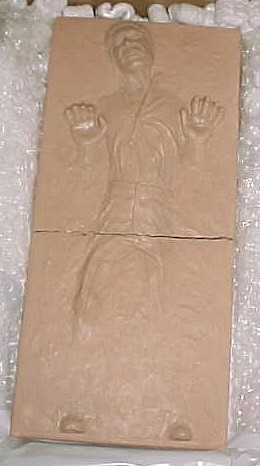 Its the original sculpting for the carbonite slab from one of Hasbro's many special Collectors Series doll sets. Just as most of Kenner's vintage-era action figures were, the piece was sculpted in a pinkish wax, specially forumlated for this type of application. As you can see, the slab is broken in half, a not-uncommon defect when it comes to wax sculptings; the wax is fragile and cannot be abused without snapping. Unquestionably, sculptings are the foremost of all prototypes. They are the first three-dimensional representations of a mass-produced product--every example of this toy sold throughout the world can be traced back to this one piece of craftsmanship.